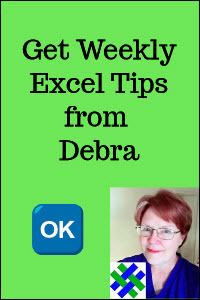 Limit the choices in an Excel drop down list, depending on the value in another cell. 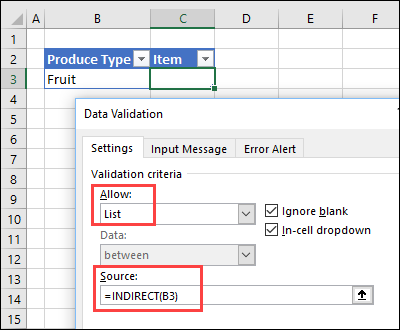 For example, select "Fruit" in cell B2, and "apple, banana, peach" appear in the dependent drop down list in cell C2. Watch the video below, to see how it works, and written steps and sample files are below. NOTE: There are other techniques for setting up dependent drop down lists, so choose the setup method that is best for your needs. This animated screen shot shows how a simple dependent drop down list works. There are setup instructions and a video in the next section. 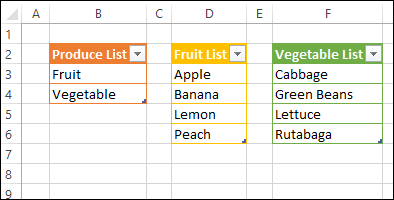 In this dependent data validation video, select Fruit or Vegetable in the first column, to limit what is shown in the drop down list in the next column. The written instructions are below the video, and the full transcript is on the Dependent Drop Down Lists Video page. Here are the step-by-step instructions for making dependent drop down lists. 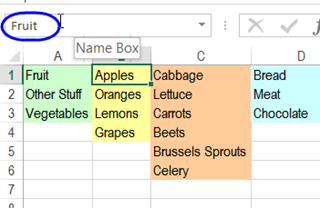 This example uses Fruit and Vegetable lists. In the screen shot below, you can see the completed data entry sheet. 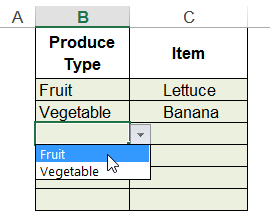 Select a produce type (fruit or vegetable) in column B. Then, in column C, a dependent drop down list show items for the selected product type only. There are a few steps for setting up the drop down lists, and the details are in the sections below. This example will have a workbook with two sheets -- a data entry sheet, and a sheet with lists. Change the name for Sheet1 to "DataEntry"
Insert a new sheet in the workbook, and name that sheet "Lists"
Next, you'll create lists with items for the drop down lists. In this example, you'll set up 3 lists. The main list has produce types, and the other two lists have items for the dependent drop downs. To type the lists, go to the Lists sheet. Start with the main list - Produce types. In cells B3 and B4, type Fruit and Vegetable. 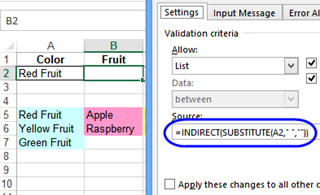 Next, type the dependent lists, with the headings Fruit List (in cell D2) and Vegetable List (in cell F2). These lists can contain one-word items (apple), or multiple-word items (green beans). 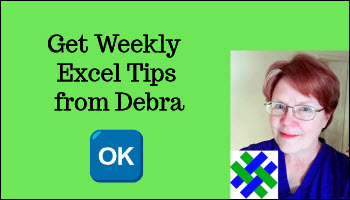 Next, follow these steps, to format each list as an Excel Table. This makes your list dynamic -- the list size will adjust automatically if you add or remove items, so your drop down will show the entire list. 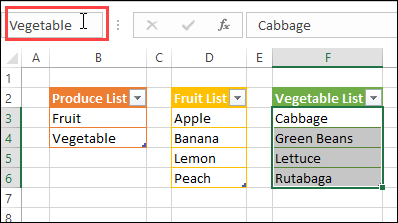 Next, follow these steps to create a named range for each formatted Excel Table.. Later, you will use this name, when making the drop down lists on the Data Entry sheet. 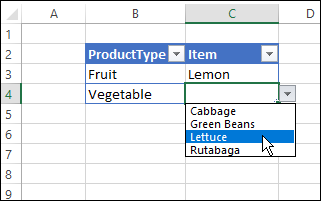 Select the items in the Produce table (cells B3:B4), but not the table heading. Press the Enter key, to complete the name. Next, follow these steps to name the fruit and vegetable lists. Type a one-word name for the list -- Fruit. 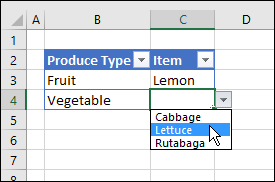 Select the vegetable names in cells F3:F6. Type a one-word name for the list -- Vegetable. Next, you'll add the main drop down (Produce Type) on the DataEntry sheet. This is just a normal data validation drop down list. First, you'll enter headings on the data entry sheet, and set up a named table. On the Ribbon, click the Data tab, then click Data Validation. Click OK, to complete the data validation setup. Next, you'll create a dependent drop down list in the Item column. This cell will have a formula to create the data validation drop down list. Read more about the INDIRECT function here. On the Ribbon, click the Data tab, then click Data Validation.. Note: If cell B3 is empty, you'll see the message shown below. Click Yes to continue. Fruit should be selected in cell B3 -- if not, select it now. Then, press the Tab key, to start a new row in the data entry table. In the Produce Type column, select Vegetable from the Produce drop down list. Move to the Item column, in the same row. 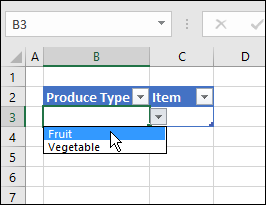 NOTE: If a Produce Type has not been selected, the Item drop down in that row will not work. 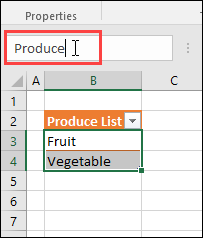 This is another example of dependent drop down lists in Excel. In this dependent data validation video, if a country is selected from the first drop down, only the cities from that country are in the drop down list. This video shows the basic set up steps, and then shows how to use the Excel IF function with a dependent drop down. The instructions in the previous sections show how to set up a basic dependent drop down list. Here are a few advanced examples. Create the first named range and dropdown list as described above. You may need items in the first Excel data validation drop-down list that contain characters not allowed in range names, such as the ampersand (&). For example, your choices are 'Red Fruit', 'Green Fruit' and 'Yellow & Orange Fruit'. 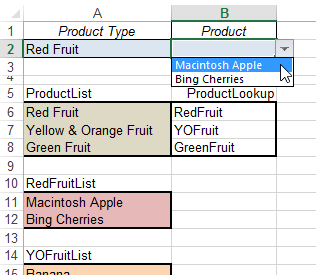 For the dependent lists, you can create ranges with one-word names, such as YOFruit. 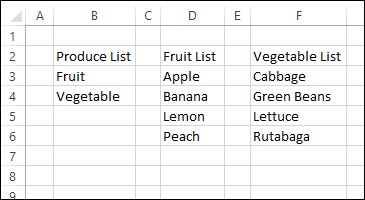 Then, create a lookup table, which lists each item in the first Excel data validation drop-down list, and the range where its dependent items will be stored. Create the first named range and drop-down list as described above. In this example, the range is named ProductList, with values in cells A6:A8. The drop-down list in cell A2 uses ProductList as its source. Create the dependent lists, and name them, using one-word names, with "List" at the end, e.g. RedFruitList, GreenFruitList, YOFruitList. In this example, RedFruitList is in A11:A12, YOFruitList is in A15:A16 and GreenFruitList is in A19:20. 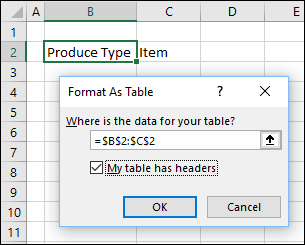 Select an item from the drop-down list in cell A2. Next, you'll create the lookup table, to match each item with its dependent items' range name. In the column to the right of the FruitList range, enter the code name for each item's dependent list. For example, YOFruit is entered as the code name for Yellow & Orange Fruit. Name the lookup table. In this example, the range A6:B8 is named ProductLookup. Select cell B2, and from the Data menu, choose Validation. For the Source, enter a formula that uses a VLookup formula to find the dependent list's range name -- a combination of the code name and "List". 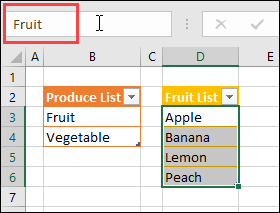 With Red Fruit selected in cell A2, the VLookup formula will return RedFruitList as the range name for the dependent list. The RedFruitList items will be displayed in cell B2's drop-down. To create a 3rd dependent drop down list, use the same techniques, to create lookup tables and items lists. 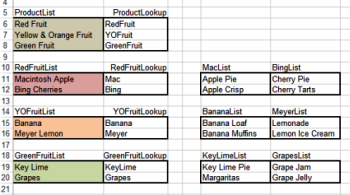 In the screen shot below, there are lookup tables named RedFruitLookup, YOFruitLookup and GreenFruitLookup. Items lists, with the code names and "List", have been added to the worksheet. The formula finds the lookup table based on the product type selected in cell A2, e.g. RedFruitLook, and gets the code for the selected product -- Mac. It adds "List" to the code, and shows the items in the MacList range. If you need to, you can add another set of dependent data validation dropdown lists that depend on the selections in the first two dropdowns. select a country and region, then select a city in the selected country and region. 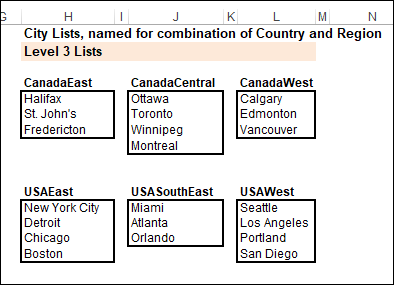 Note that the region names are not unique -- there is a West region in both Canada and the USA -- so we can't show a City list that is only based on the region names. To make sure that the correct list of cities appears, the city lists will be named for the country and region. 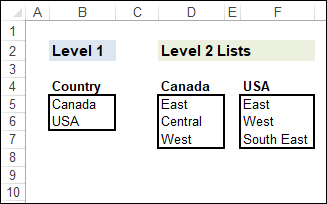 There are 2 countries, and each country has 3 regions, so we will set up 6 named ranges for the 3rd level drop down lists. NOTE: If you need more than a few named ranges for your 3rd level lists, try the Dependent Lists with Tables technique instead -- it will be easier to set up and maintain. Create the main named ranges - Country, Canada and USA, as described above. Create another set of named ranges, naming them for the available combinations in the first two lists. For example, create ranges named CanadaWest and USAWest. 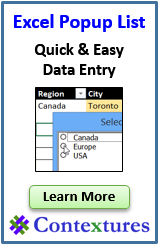 On the data entry sheet, set up drop down lists in the Country and Region columns. For the source, use a formula that combines the entries in the first two columns. 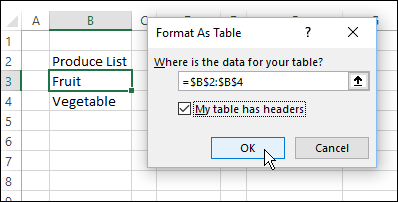 To avoid the problem, use named Excel tables, instead of formula-based dynamic ranges. Then, use one of the INDIRECT function examples shown above, to create a dependent drop down list. Create the supporting named lists, and name the first cell in each range, e.g. cell B1 is named Fruit and cell C1 is named Vegetables. After someone selects an item from a dependent drop down, they could go back to the main drop down, and select a different item. That could result in mismatched items in that row. For example, Fruit could be selected from the main drop down, and then Lemon in the dependent drop down. If Fruit is changed to Vegetable later, the Lemon selection would be incorrect -- it's not a vegetable. To block changes to the first list, you can change the data validation formula, so the list does not appear unless the second cell is empty. This video shows you how this technique works, and written instructions are below the video. With dependent drop down lists, problems can occur, if someone goes back to the first list, and changes it. Then, the first and second selections are mismatched -- for example, in the screen shot below, Vegetable is the first choice, and Banana is selected in the second column. To block changes to the first list, you can change the data validation formula, so the list doesn't work unless the second cell is empty. 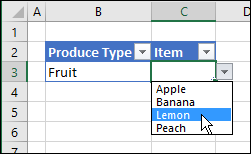 Instead of just referring to the Produce range for the Produce Type drop down, the formula will check for an entry in the Item column. If an item has been selected, the drop down will try to show the range created by the INDIRECT function -- "FakeRange". Because there is no range with that name, the result is an error, and the drop down will not work. Now, the drop down in the first column won't work if the Item has been selected in that row. 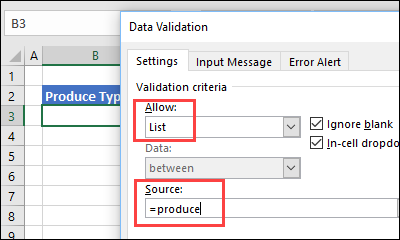 In the previous section, the data validation formula was designed to prevent selections from the first drop down, if the cell to the right contained data. Another option is to use a macro, to clear the dependent cell, after making a selecting in the first drop down. That will prevent mismatched selections. 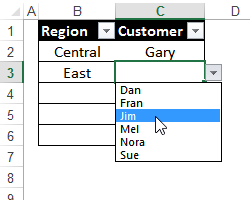 In this example, column B contains a drop down list of Regions. 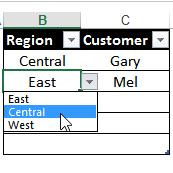 After you select a Region, the drop down list in column C shows the customers in the selected region. Go back and select a different region, and the existing customer name will be cleared. When you select a Region, event code clears the cell to the right. To add the code, right-click the sheet tab, and click View Code. Paste the following code onto the sheet module. You might need to change the column number, to match the column number on your worksheet. NOTE: The sample workbook also has code for clearing multiple dependent cells.